The Institute Library, which opened in 1929 with a mere 3,000 titles donated by St Michael’s College, today has holdings of about 150,000 volumes whose lustre is enhanced and complemented by specialized collections of 9,000 reels of microfilm and 60,000 slides. The Institute Library is located on the fourth floor of the John M. Kelly Library of St Michael’s College at 113 St Joseph Street, Toronto. The Institute Council alone exercises control and authority over Library policies and use. Access to the library is normally granted to those professors and graduate students of the University of Toronto who need to consult unique copies or materials not otherwise accessible. Every reasonable opportunity to use the library is also given to visiting scholars, particularly Guests of the Institute. Please note the following schedule. While every effort is made to keep information current, patrons are requested to confirm opening hours and any other matters relating to access or to the collections directly with the library staff (see below). For questions regarding policy and acquisitions, please contact the Librarian, Dr Greti Dinkova-Bruun. 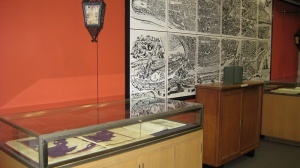 To consult rare books and manuscripts, please contact James K. Farge, CSB, Curator of the Rare Book Room, at 416 926 7283. To consult the collections, and for general information, please write to Michael Sloan or telephone 416 926 7146. Reference questions should be directed to William Edwards at 416 926 1300, ext 3423. The Library is owned and operated by the Pontifical Institute of Mediaeval Studies, which alone exercises authority over its policies and use. It functions as a research library. Fellows, Associates, Guests, and Staff of the Pontifical Institute. Professors and Graduate Students in the Centre for Medieval Studies or other Departments of the University of Toronto who are working in medieval studies. Undergraduate Students Majoring in Medieval Studies at St Michael's College. Visiting Professors and Graduate Students from other universities working in medieval studies. Please provide reference on university letterhead. Private scholars working in medieval studies. Others needing materials held uniquely in this library may be given access for the day. The Library Pass must be shown to the door monitor upon entry. Please sign the register. Although access is gratis, salaried card holders are urged to help support the Library by becoming members of the Friends of the Library. Only materials for research (notes, paper, laptops or writing materials) may be brought into the Library. All other materials (such as briefcases, large purses, bags, and books from St Michael's College Library that have not been checked out) are to be consigned to the lockers provided. Sixty personal lockers inside the library are available for an annual fee ($5.00) and a key-return fee ($15.00). They are suitable for purses, laptops, notes, and microfilms. When photocopying, please avoid pressing on the book spine. Books likely to be photocopied by multiple users in a course should be copied one time only, and that master copied provided for re-copying by others. For reasons of conservation, Folio and Oversize books MAY NOT BE PHOTOCOPIED. The latter should be consulted on the reading stands. 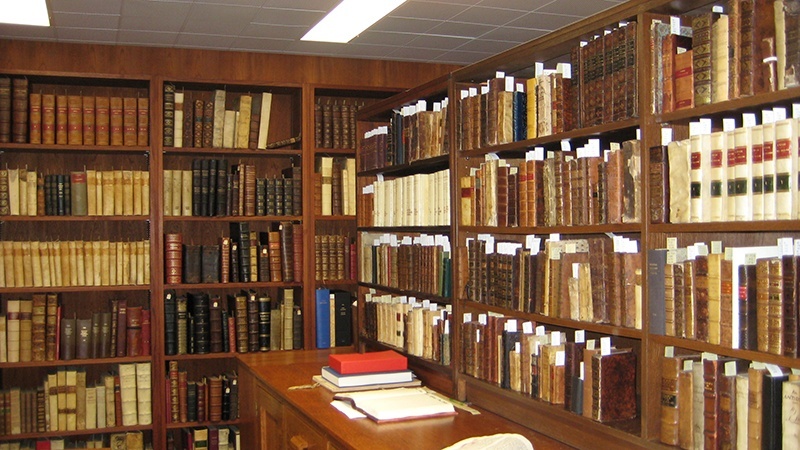 Bound journals and books in the Reference and Palaeography Rooms should be returned to the shelves daily by the user. All other books should be returned daily to the re-shelving trolley at the entrance to the stacks. Please exit the Library for conversations. Please do not engage the door monitor in conversation. No food, drink, or use of cell phones is permitted in the Library. Notices posted on the bulletin boards are subject to the approval of the Librarian. Refusal or failure to observe these regulations may result in loss of library access. The entire collection is non-circulating. 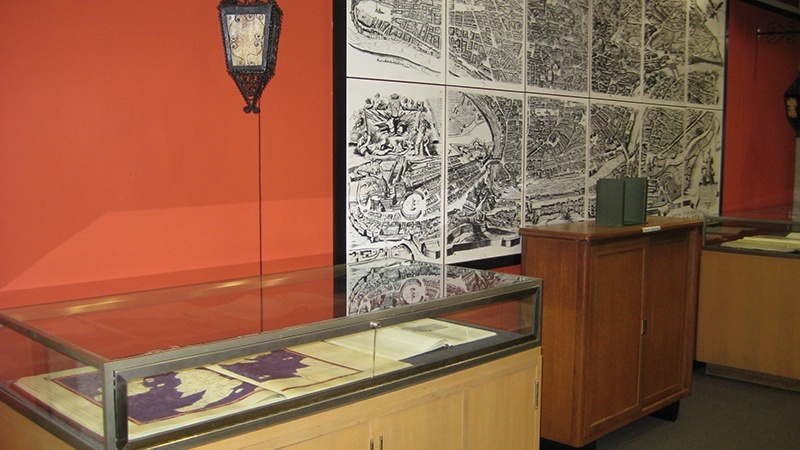 For a description of its resources, see A Conspectus of the Collections. The library maintains separate catalogues for its holdings of printed books, microfilms, and many of its slides. 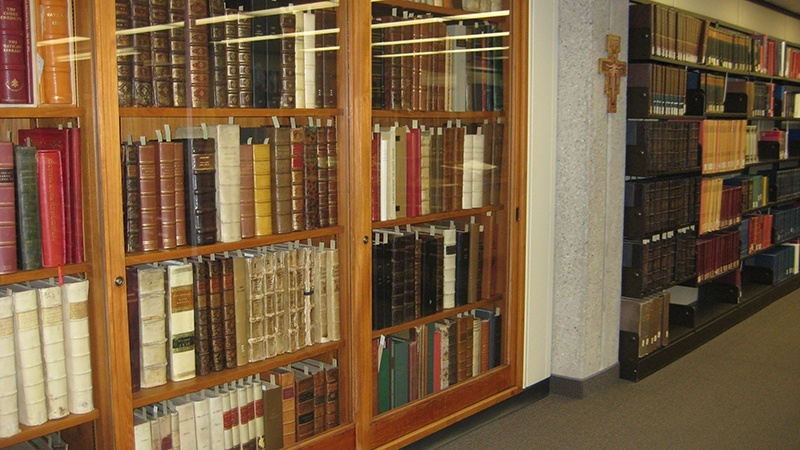 Its catalogue of printed books is now searchable through the University of Toronto's computerized Library Catalogue but the shelf-list of manuscripts on microfilm, the microfiches of the Vatican Palatine Collection of early printed books, and journal holdings have not been entered into the on-line catalogue. 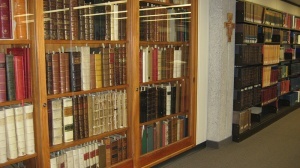 In addition to the principal collections of sources indispensable to any research on the Middle Ages (such as the Patrologia Graeca, Patrologia Latina, the Corpus Christianorum in its various series, the Monumenta Germaniae Historica, the volumes of the Acta Sanctorum) and major reference works (such as the Pauly-Wissowa and Der neue Pauly, the Italia Sacra, and the Gallia Christiana), patrons also have access to CD–ROM databases of the Corpus Christianorum series (CETEDOC), the Catalogue of Latin Incipits, and Thomas Aquinas’ Opera omnia (for further details, see A Conspectus of the Collections). The Institute library contains seminar rooms, six individual offices (wired for network access), open study carrels, microfilm readers, a microfilm digital reader-printer with greyscale capabilities for enhancing images, as well as computing and photocopying facilities. The Library now provides full-colour scanning service of most of its collection. This requires that scans be sent to the patron’s email address as an electronic copy (JPG/TIFF/PDF). We aim to have the electronic copy sent within 24 hours of request (with the exception of weekends and holidays). The cost for this service is $0.25/page. Requests must be made in person as payment is required prior to the scanning. Further details and the scanning request form are available. During the period July 2014–June 2016, the Library has acquired about 6,000 new volumes (3,000 purchased by the library and 3,000 donated). Among these new arrivals 85 were volumes of new periodicals which were added to the collection: Chora: Revue d’etudes anciennes et medievales; Convivium: Exchanges and Interactions in the Arts of Medieval Europe, Byzantium, and the Mediterranean; IKON: Journal of Iconographic Studies; Journal of the Australian Early Medieval Association; Medieval Low Countries; Neulateinisches Jahrbuch; Perspectives Medievales; and Phaos: Revista de estudos clássicos. In addition, the Library purchased a facsimile edition of the Pamplona Bible produced in the royal chancery at Pamplona in ca. 1200. Other notable purchases include: a facsimile edition of thirteenth-century The Herbal of al-Ghafiqi; a facsimile edition of Dante Guarneriano from Friuli; a 1560 Antwerp edition of Johann Ferus’s Postillae sive conciones in epistolas et evangelia iam primum latinitati donatae; a Confessor’s Manual printed in Köln in 1592; a 1511 Paris edition of the De perseverantia religionis libri septem written by the 15th-century Italian humanist Mapheo Veggio; a 1681 Amsterdam edition of the Mythographi latini; a third expanded version of the famous Lexicon medicum of Stephanus Blancardus, printed in 1738 in Halle; 11 volumes of the Opera omnia medica of the Catalan physician Arnaldus de Villa Nova (d. 1311); and 9 volumes of Meister-Eckhart-Jahrbuch. We also filled gaps in a number of series and encyclopaedias, most notably, Indici e Cataloghi; MGH: Hilfsmittel and Studien und Texte; and Das Reallexikon für Antike und Christentum. 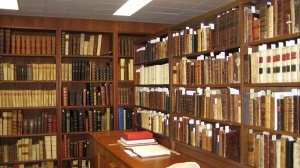 We estimate that we have about 92,000 titles or over 130,000 individual volumes (not counting the 20,000 books on microfiche or microfilm); rare books ca. 2,500 (38 incunabula); 43 manuscripts in Latin, Greek and vernacular languages; 50 single manuscript pages; ca. 200 parchment documents; ca. 10,000 manuscripts on microfilm; and about 1,900 CD-ROMs and DVDs of papal registers preserved in the Vatican Archive. The Library collection comprises as many as 440 scholarly journals in 10 different languages. We currently subscribe to 182 periodicals, of which 88 represent the only Toronto holdings. Forty-one of these periodicals are received in exchange for the Institute’s prestigious journal Mediaeval Studies. We also hold around 8,000 offprints of scholarly articles and pamphlets and about 60,000 colour slides, 10,000 of which have been digitized. The PIMS Library contributes to the Central Library’s purchases of the on-line resource Brepolis which is made available to everyone with access to the U of T system. During the past two years (up to 15 April 2016) we had 977 registered readers. Most of them (863) were Canadians from 9 different provinces and 38 different academic institutions. From the USA 58 users came from at least 16 different states and 25 different universities. Fifty-four patrons from overseas used the Library, of which 17 were from England. On the average we serve 20-25 patrons each day. We provided access to 195 microfilms/microfiches and CD-ROMS, and around 182 items from the “Joseph Pope Rare Book Room” were given to consultation. We received 316 requests for Inter-Library Loans; of them 83 could be filled by providing digitized photocopies of the requested materials. The revenue generated from this activity was used for new acquisitions. Father Farge and the Librarian gave many tours of the Library to individuals, classes, and students from numerous universities and programs as well as to members of various professional and religious organizations. We are grateful to the Janet E. Hutchison Foundation, James Estes, Maruja Jackman, Jill Webster, William Edwards, and George Rigg for their generous contributions to our acquisitions funds and special projects. As always we are very grateful to the Friends of the Library (FOTL) for their numerous initiatives and continuous support. We would like to express our thanks to everybody who have donated money for the Library through FOTL. The value of the gifts in kind (i.e. books, microfilms and papers) to the Library amounted to over $50,000 over the years covered by this report. We received particularly large numbers of books from the libraries of Sheila Campbell, Ann Dabrowski, Gerald Guest, Gertrud Jaron Lewis, and Stuart Rutten. The books of Ann Dabrowski and Stuart Rutten enriched significantly our holdings in the fields of Classics and Celtic studies. Smaller donations of books were received from Graysanne Bedell, James Carley, Konrad Eisenbichler, Juliette Gibbons (in memory of Matie Molinaro), Douglas Hay, Christopher McDonough, Erika Rummel, the ITER project at the Robarts Library, the Regis College Library, and the Library of the CRRS at Victoria College. Microfilms of medieval manuscripts were donated to the Library by Michael Elliot, Brad Inwood, Tina Marshall, and Ron Thomson. Other gifts in kind (primarily books), donations for journal adoptions and other acquisitions came from Alexander Andrée, Christer Bruun, William Callahan, Sheila Campbell, James Carley, Marc Cels, Isabelle Cochelin, Evelyn Collins, Giles Constable, Indre Cuplinskas, Brian Dalsin, Corinne Denoyelle, Father Martin Dimnik, Greti Dinkova-Bruun, Pat Duggan, Stephen Dumont, William Edwards, Father James Farge, Joanne Findon, Joe Goering, James Hankins, Michael Herren, Ann Hutchison, Maruja Jackman, Margot King, Peter Konieczny, Christine Kralik, James Long, Father James McConica, John McErlean, Jeannie Miller, Michèle Mulchahey, Stella Panayotova, Martin Pickavé, Wendy Pfeffer, Heather Darling Pigat, Olga Pugliese, Myra Rosenfeld-Little, Erika Rummel, Brain Stock, Alain Stoclet, Ron Thomson, Jill Webster, and Amanda Wetmore. Our apologies to any donors whose names we have failed to record. The generosity of all donors is truly appreciated. We wish to acknowledge the work of our staff, Michael Sloan and William Edwards, and to Michael Bramah of the Kelly library for his assistance in both acquisition and cataloguing.